Born 1949 in the village of Yalo – Jerusalem , Palestine . Teaching experience of various art courses for more than 20 years in a number of Arab universities. Many personal exhibitions in the Arab world . Though there are a number of approaches on how to tackle the Palestine problem, it seems that martyrdom is the solution. (El-Ghizira TV. Station, “Guest and Cause Program”, April 1999). – The commitment to concerns of the nation and its cause, asking for inspiration from heritage and modernization are important elements in the movement of contemporary Arab art. (Dubai TV., “The Arabic Home Program”), May 1997). – It is great to practice the profession on Palestine in the epic “Journey of great nation”. (El-Nour TV., Ariha, Palestine, January 2000). Newspapers & Magazine & TV. – His work is a civilized and humanistic continuation… It is a cry from the depth of existent nation for justice to regain their plundered human rights. (The Artist Hamid Nada, Professor of Fine Arts, Cairo 1972). – An Artist with deep sorrow is trying to break into the future to stick with hope. (Kamal El-Gowaly, El-Masaa Newspaper, Cairo 1972). – A student invaded the galleries, the most attractive aspect of his paintings is this brave touches in bold colors. This ensures that this artist will have a great role in the movement of Jordanian Arts. (Rabah El-Sughair, Al-Rai Newspaper, Jordan – Amman 17-11-1975). – A human being who dissolves in his art, he practices it in great happiness and love, his art comes strongly from his unconscious especially in this murals. (Haiat Atia, Al-Rai Newspaper, Jordan – Amman 20-11-1980). – We have a distinguished Art Movement, which heading towards universality, Ibrahim Abu-Rub is qualified tomove towards universality, because of his new style and approach, which is on the track of the work masters. (Mustafa Salh, Al-Dustor Newspaper, 16-11-1980). – The Artist Ibrahim Abu-Rub is a good example of an artist fighting for his cause of his people, we hope that he will live to see his sculptures standing in public in cairo, and Jerusalem. (Mohamed Helme, Ibda, Egyption Magazine, Cairo, 1980 ). – Fascinated by painting on large murals, Ibrahim practices some rituals through drawing shapes that come to light suddenly mixed with emotions and inspiration to capture the event. (Farouq Youssef, Al-watan Newspaper, Doha 4-11-1999). His steadily standings and rigorous commitment to his cause aggravated by the blood of martyrs shows on his large murals, his murals reveal what happen in ‘Khalil Massacre and yallow Jernica Palestine” etc. You can easily read the large murals of Ibrahim Abu-Rub by looking at his insurgent face that resembles the land of Palestine. (Zahead Harsh, Al-Itihad Newspapers, Haifa 20-8-1999). – He is one of the most expressionist Palestinian harehness with tendency to paint on large murals that the explodes with colors and movement helping him to achieve is objectives to resist coercion, torture and injustice. 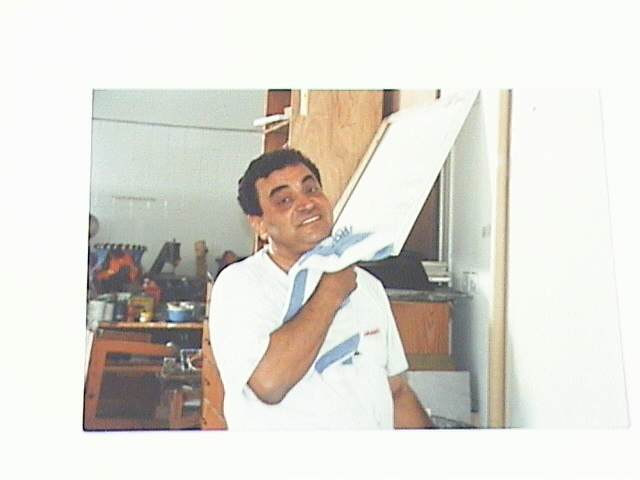 (Ismail Shamot, Palestine Plastic art, Kuwait, 1989). – He expresses his feelings on the surface of his painting through the stokes of the brush, especially on his murals where the mass and the form directed towards the horizon. (Mohamed Abu-Zuriq, Panorama of the Fine Art in Jordan, Ministry of Culture, Amman 1990). – In Ibrahimg drawing lines, there is intensity, courage and experience, this is accompanied by expressional style charge with explosive power and speedy strokes of the brush. (Princess Wigdan Ali, National Museum of Fine Arts, Amman, 1996).